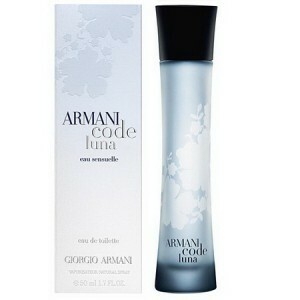 Armani Code Luna creates a magical atmosphere & you shrouded in mystery. Giorgio Armani Code Luna Eau De Toilette 75ml. Perfume for Women creates a magical atmosphere and you shrouded in mystery, romance and seduction. A woman wearing perfume Giorgio Armani Code Luna is infinitely more sensual and more mystical. The inspiration for this fragrance was mysterious moon. Top notes of the fragrance Armani Code Luna are given juicy pear, mandarin and bergamot sweet drinks. Base note is magical orange blossom and final note of the perfume is essentially represented by Tonka combined with cedar wood and vanilla. Luxury Perfume Giorgio Armani is a perfect choice for everyday or for a romantic date. Be magnificent, graceful and attractive, not only in the moonlight, sensual perfume Giorgio Armani Month. moon creates a magical atmosphere and you're enveloped in mystery, romance and seduction. A woman wearing perfume Giorgio Armani Code Luna is infinitely more sensual and more mystical. The inspiration for this fragrance was mysterious moon. Top notes of the fragrance Armani Code Luna are given juicy pear, mandarin and bergamot sweet drinks. Base note is magic on orange blossom, and the final grade perfume essence is represented by Tonka combined with cedar wood and vanilla. Luxury Perfume Giorgio Armani is a perfect choice for everyday or for a romantic date. Be magnificent, graceful and attractive, not only in the moonlight, sensual perfume Giorgio Armani moon.